Over 2017, major media outlets published innumerable articles discussing the challenges that most cannabis businesses face when trying to raise money -- especially taking into account that traditional small business loans are not available for an industry that is still deemed illegal by the federal U.S. government. While the challenges remain very real, things are changing rapidly, with the pace of investments ramping up quickly and conditions for these marijuana businesses ameliorating consistently. Let's take the Viridian Cannabis Deal Tracker, a unique database that tracks capital raises and M&A activity in the cannabis industry, as reference. As per Viridian Capital Advisors' data, the first five weeks of 2018 saw investments in marijuana companies exceed the $1.2 billion mark, matching deals for all of 2016. Furthermore, in the first 60 days of the year, the cannabis industry has gotten almost $2 billion in new funds -- year-to-date through March 2. This compares to $456.6 million in raises for the first nine weeks of 2017. Now, the marked surge in investments coupled with a substantial rise in the size of the average raise (which went from $6.2 million in the first 60 days of 2017 to $15.5 million in the first 60 days of 2018), signal not only an increased interest in the cannabis industry, but also better conditions to raise money for cannabis companies, and thus, an larger desire to do so. The argument is pretty simple, though: More liquidity means more opportunity. 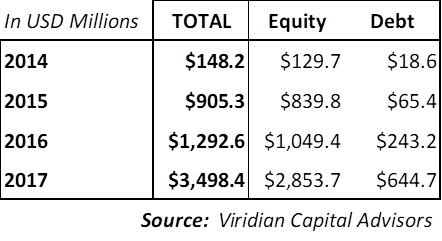 Interestingly, Viridian's president Scott Greiper told me that the larger players in the investment space are either funding public companies up in Canada or backing private companies in the U.S. -- but not a lot in public companies in the Land of the Free. "Penny stocks, public over-the-counter stocks in the U.S. are dissuading the larger investors from putting money into public companies here," Greiper said. One of the most interesting trends for entrepreneurs coming into the cannabis industry is the ability to raise money from people beyond their uncles, parents and friends. "Access to more sophisticated investors has improved materially over the last couple of years," Greiper agreed. "That talks not only to the amount of capital coming in, but to the fact that investors are willing to place larger bets on earlier stage companies. So, the ability to get funded is better today than it was over the last three or four years." In addition, investors are willing to take equity in companies, instead of just debt, like they used to. Let's take a look into what that means. 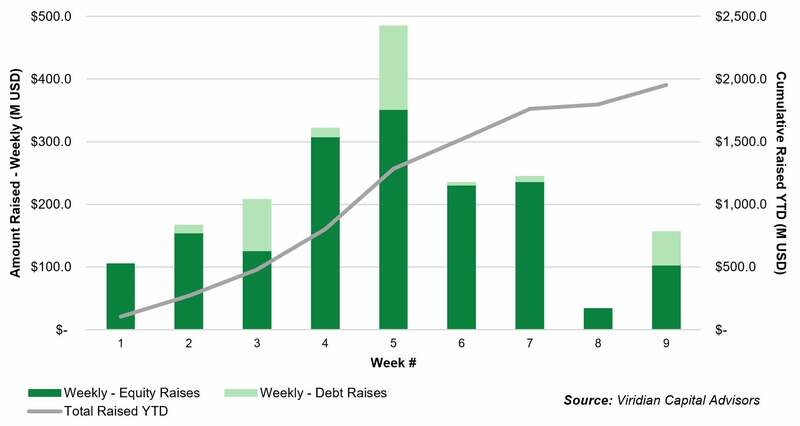 Beyond the fact that money going into U.S. cannabis companies is largely attracted by private companies, the other big underlying trend here is the transition from debt-backed raises to equity-backed raises. As the Tracker shows, roughly 85 percent of the raises completed over the first 60 days of the year used equity structures, up from 72.9 percent in the same period last year. "This reflects a change in investor risk tolerance, i.e., the fact that investors are pursuing the financial upside as equity investors, rather than just trying to protect their downside risk as lenders," Greiper noted. As Greiper explained in my Entrepreneur Press book, Start Your Own Cannabis Business, "Back in 2014, most companies were raising debt. No matter what kind of debt, the fact of the matter is that, for an emerging growth company without a lot of existing revenues, cash flow, or big backlog of forward revenues, you may be in a position where you can't either service the debt and keep it current, or pay off the debt when it comes due (...) And this is a real problem, because then someone else will own your company." “In 2014, many companies could only get loans. Either straight loans or convertible loans,” Viridian’s vice president Harrison Phillips added. Now, equity raises are much more common. Learn all about funding a cannabis business in Start Your Own Cannabis Business, available for pre-order following this link.